Behavior Frontiers is proud to announce that we are bringing our exceptional applied behavior analysis (ABA) treatment program and clinicians to San Gabriel Valley/Pomona, California. We currently provide applied behavior analysis (ABA) treatment services to children in the home, school, or community settings. Our ABA treatment services are designed to help children reduce their problem behaviors and learn appropriate replacement behaviors, such as socialization and communication skills. Families access our ABA treatment services through school district, insurance company, regional center, or private funding. Azuza, Baldwin Park, Chino, City of Industry, Claremont, Glendora, Hacienda Heights, LaVerne, Montclair, Ontario, Pomona, Roland Heights, San Antonio Heights, San Dimas, Upland, Walnut, West Covina. Joy Wong received her Bachelor's degree in Psychology with an Applied Developmental Psychology minor at UCLA where she was introduced to the field of ABA through a course taught by Dr. O. Ivar Lovaas. After working as a Behavior Interventionist for over 5 years, she became a Case Manager/Supervisor while continuing her education to receive her Master's degree in Teaching with an Applied Behavior Analysis Specialization from National University and obtain her certification as a Board Certified Behavior Analyst (BCBA). Joy has worked with typical developing children and those diagnosed with Autism Spectrum Disorder (ASD) and other developmental disabilities aging from infants to adolescents since 2002. She has experience in the child care setting, providing private consultation, working with school districts and providing ABA services to clients funded through regional centers, school districts and insurance. 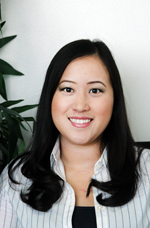 Joy oversees the clinical programs of clients in the San Gabriel Valley area. She is dedicated to helping children and their families reach their fullest potential by providing parent education, individualized treatment programs and ongoing support to her team with collaboration between her clinical staff and families. Elizabeth Gudiel began her career in the field of Applied Behavior Analysis in 2010 as a Behavior Interventionist, shortly after she was promoted to a Senior Bi and then to Case Manager/Supervisor. She continued her education and received her Master’s degree in Teaching with a Specialization in Applied Behavior Analysis from National University in 2012 and obtained her certification as a Board Certified Behavior Analyst (BCBA). Elizabeth has worked with individuals with Autism Spectrum Disorder (ASD) and other developmental disabilities aging from infants to adults. She has experience in implementing ABA strategies in home, school, daycare, and community settings. She is dedicated to provide high quality services, individualized and client centered treatment plans, and ongoing collaboration with her clinical teams and families.